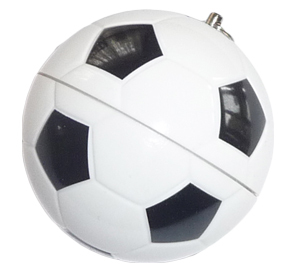 If your business is sports, this soccer ball shaped USB is a fun and unique promotional USB. 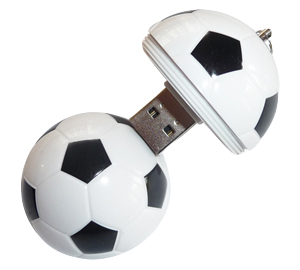 The soccer ball USB can hold a great logo print and you can be sure that your customers and clients will love getting their hands on one of these. With an overall screen printed logo size of 8mm x 8mm on one side and 10mm x 10mm on the second side, everyone is going to remembering who you are. 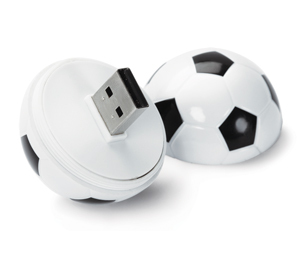 The soccer ball splits in two to reveal the USB with a high quality memory chip. They will work on almost all computers without the need to download any software which makes them great for customers and clients who move from computer to computer. When you work in the sporting industry it can be hard to find personalised promotional material, but promotional USB 131 will be sought after by everyone you work with.